At WeddingOfficiants.com – The Wedding Officiant Directory, we’ve been connecting engaged couples with wedding officiants for more than 15 years and one of the most frequent questions we get asked is “how much does a wedding officiant cost?” This is a simple question with a somewhat complex answer, which we have done our best to provide here. After reading, we encourage you to search our directory of professional officiants to find the perfect officiant for your wedding ceremony – thank you for visiting! The cost of a wedding officiant can vary wildly, from free to well over $1000 for a single ceremony. In order to understand the differences in fees between different officiants, it’s important to understand that that the word “officiant” can mean a lot of different things. So, what is a wedding officiant? The term “officiant” refers to anyone who performs a wedding ceremony, from experienced religious priests and pastors, to professional ministers and celebrants who perform wedding ceremonies for a living, all the way to someone’s random friend or relative who performs a single wedding ceremony one time and never does it again. Because this definition is so broad, it’s important first to decide what kind of wedding officiant you are interested in hiring for your wedding. If your marriage ceremony isn’t particularly important to you, or if you are simply interested in getting legally married and won’t be having any type of ceremony, then perhaps hiring an amateur officiant is appropriate. However, if you are planning to have a ceremony, especially one with invited guests, then hiring a professional officiant or an experienced clergyman is definitely the best course of action. 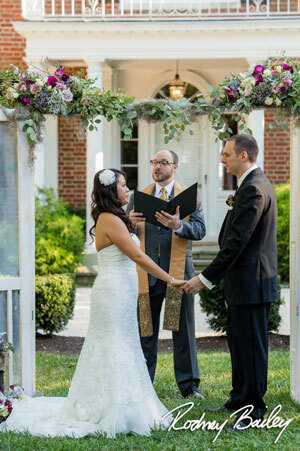 What is a Professional Officiant? 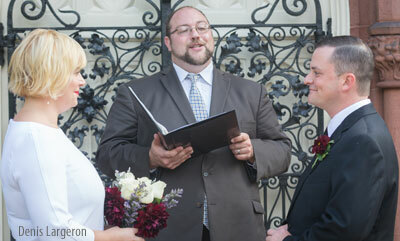 What is a Wedding Officiant? While “officiant” is a general term describing any person who is able to legally sign a marriage license, a professional wedding officiant is someone who solicits business from the general public to perform marriage ceremonies for a fee. This distinction is important, because when couples are searching for an officiant for their wedding ceremony, they are typically only looking for either clergy, which can be priests, ministers, pastors, rabbis, cantors, and other persons ordained by their religious tradition (who typically do not solicit business from the public), or they are looking for an experienced, professional wedding officiant that they can hire. 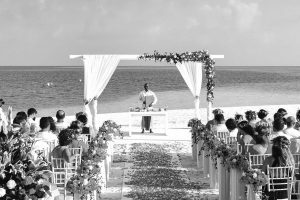 Professional officiants also differ greatly from amateurs, since professionals maintain high standards of quality because they rely on their experience and reputation among other wedding professionals to garner more business. Amateurs typically solicit their business from websites with little or no quality checks such as Craigslist, Thumbtack, or Respond.com. For more information and advice on this topic, read our article on how to find a wedding officiant. What is the Average Cost of an Officiant? It’s difficult to get a true average price of wedding officiants because there is no reliable data on the subject. While amateur officiants and individuals simply looking to make a few dollars may charge a couple as little as $100-$250, the average fees for professional officiants typically range from $400 to $800 depending on experience and the level of service and customization they provide. Many clergy such as priests and rabbis can cost well over $1000, often asking couples to make a donation to their church or synagogue in lieu of being paid directly. Factoring out the low rates from amateur officiants as well as the impact of individuals performing ceremonies at no charge to the couple, our determination is that the average cost for a professional wedding officiant is roughly $600 per ceremony. How much a specific wedding officiant may charge you for your wedding depends on a number of factors, especially if you are considering hiring a professional, experienced officiant. Some will include premarital counseling and the wedding rehearsal as part of their fee, although these items are typically separate from the cost of the ceremony itself. Many professional officiants will also create a fully customized wedding ceremony for each couple, which takes quite a bit of time and talent and can also increase the cost. The question to ask yourself is, how important is the ceremony to us as a couple? If it’s important to you, then hiring a good professional wedding officiant should be an investment at least equivalent to the amount you’re paying for your wedding cake or the DJ at your reception. Great talent often comes at a premium price and, while the price someone charges isn’t always a guarantee of the quality of their work, the more talent and experience an officiant has, the more they will typically charge to perform a wedding ceremony. Once you have decided how important the quality of your wedding ceremony is to you as a couple, and what range of investment you’re willing or able to make for a professional wedding officiant, do yoiur homework. Search for wedding officiants in your area and look at their websites and marketing. Read online reviews on websites like WeddingWire. Ask the other professionals you’ve hired for your wedding if they have recommendations for good officiants in your area. The best officiants will also have a great reputation and will be familiar to the vendors in your local area. Take the time to do your research, and choose wisely – a fantastic wedding ceremony can be the highlight of your wedding day if it’s done well. Finding Wedding Officiants is easy by searching our trusted network of top-rated Wedding Officiants. WeddingOfficiants.com © 2018. All Rights Reserved.